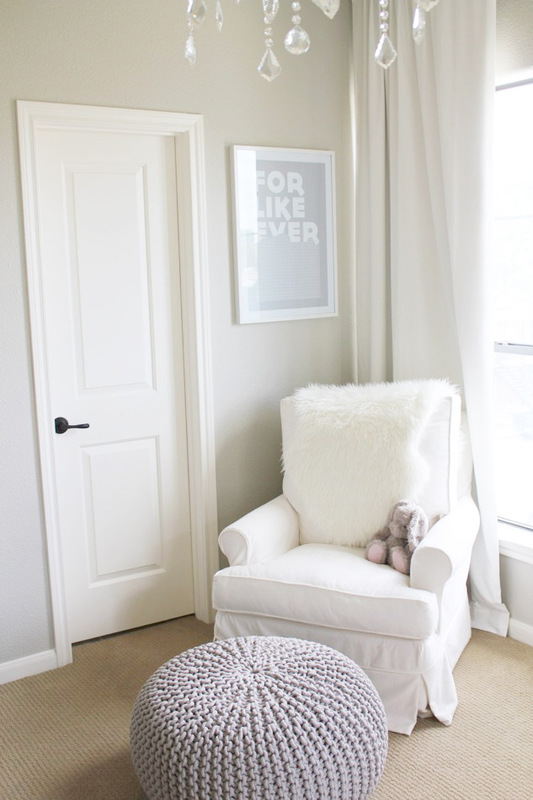 Welcome to a dreamy nursery fit for a precious baby princess. Beautiful mommy, Veronika is a wonderful fashion, decor and life-style blogger at Veronika's Blushing and a current resident of my home town of Houston, Texas. I'm always so proud to shine extra light on my fellow Houstonians on Fawn Over Baby. 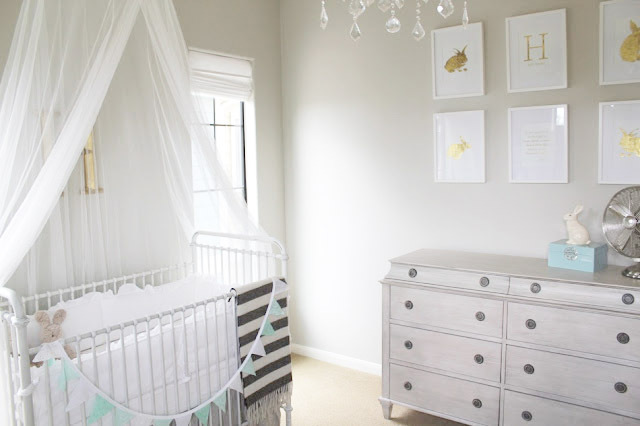 With style, fashion and beauty advice that could have you reading her blog for hours, Veronika's nursery reveal is just as captivating and inspirational. While pink was her first color of choice, it didn't quite turn out as she had hoped so she went back to the drawing board and decided on a beautiful mint green. This tranquil color pallette set the stage for a crisp and clean neutral setting for baby Harper to call her comfy/cozy retreat. I love how Veronika used calming and soothing fabrics to soften the space while incorporating a few sparkly accent pieces to add that touch of bling that every girl appreciates. 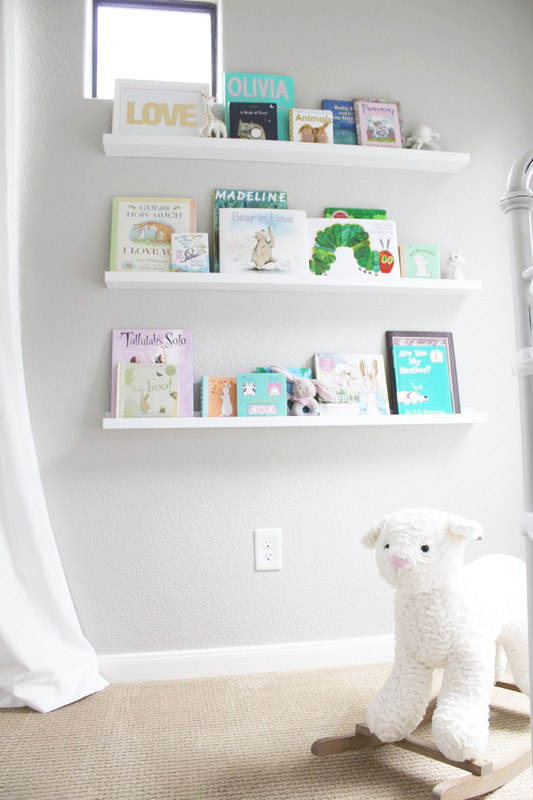 With the adorable addition of wall shelving that Veronika assembled to house baby Harper's collection of whimsical picture books, it also added a touch of color that helped to balance out the beautiful neutral tones! 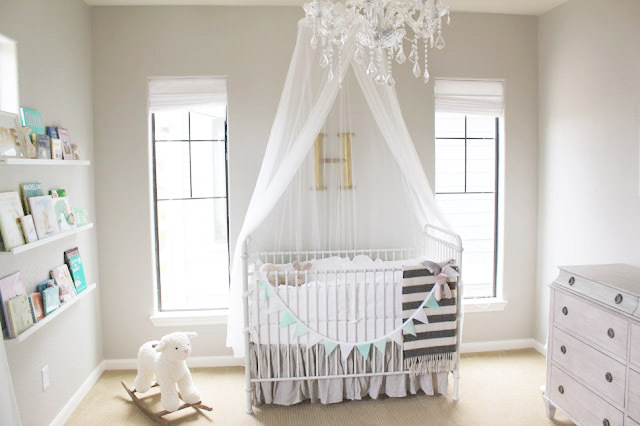 To see Veronika's source list of all the delightful details that make up this charming baby oasis, stop by to view her nursery reveal on Veronika's Blushing! 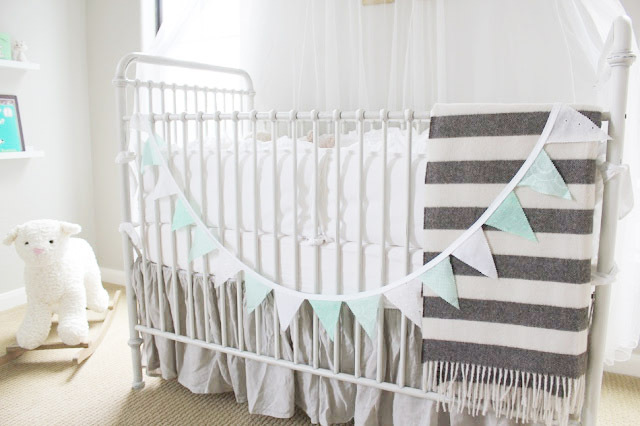 Get ready to Fawn as we take a look inside baby Harper's beautiful nursery! It is so perfect. Gorgeous! Thanks for stopping by Mom! Xoxo! Adore her dress and the gold accents in the room! I seriously love Harper's nursery, so beautiful. Veronika you did an amazing job!! Yes! I hear ya! 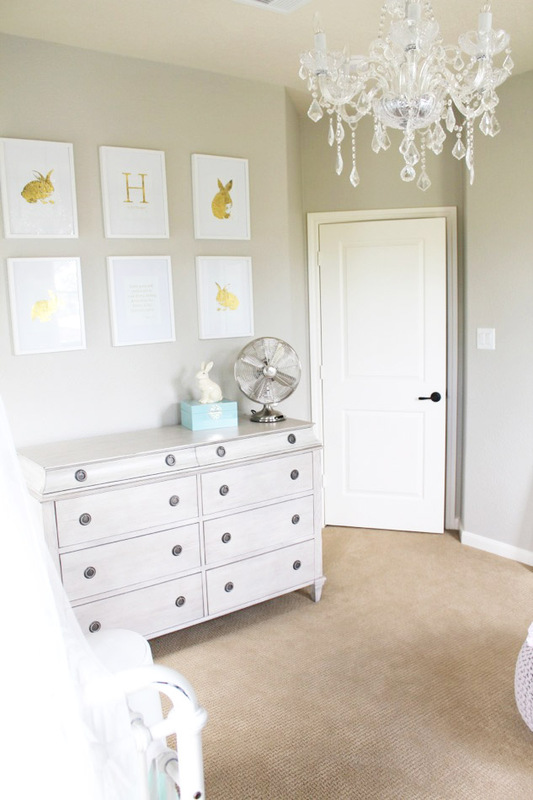 I love every detail of this sweet nursery! The book shelves are such a PERFECT touch and I love how it serves as a decor piece as well as a functional piece! 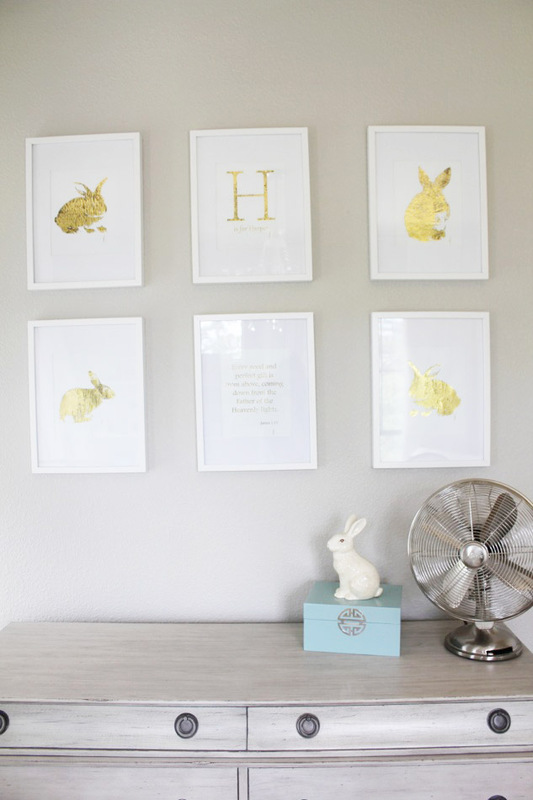 Mint is one of my favorites and I love how she subtly used it in this nursery. It is so serene and beautiful! What is the name of the paint? so pretty! Lorien, the wall color is- the walls are Benjamin Moore's "Revere Pewter"
hello! where can I get the gold letters from? Like the 'H' above the crib? Where did you buy those book shelves? 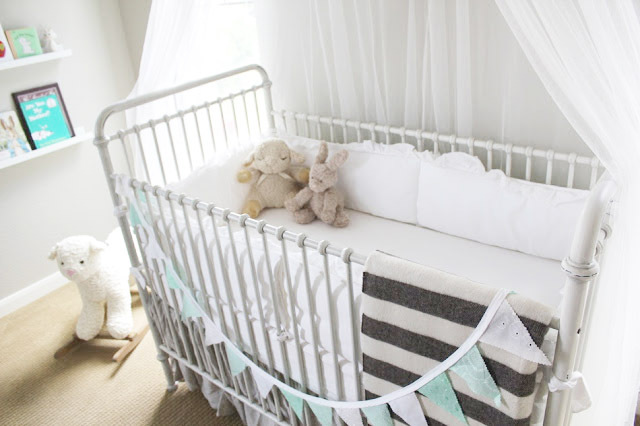 This nursery is actually from Veronika's Blushing Blog. I believe she bought the shelves at IKEA. 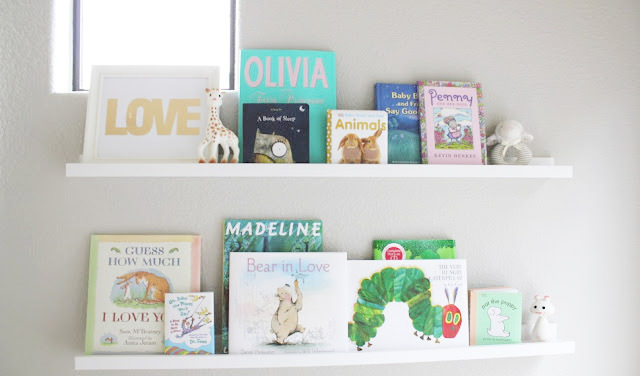 Veronika provides the actual link in her nursery reveal on her blog(the link is above). Love, Love, Love! Where did you buy the gray rope ottoman? Hi I love that canopy! Its perfectly sheer!! Where can I get pls??!?! I desperately need that! !